PCR amplification of DNA is routine in modern molecular biology. 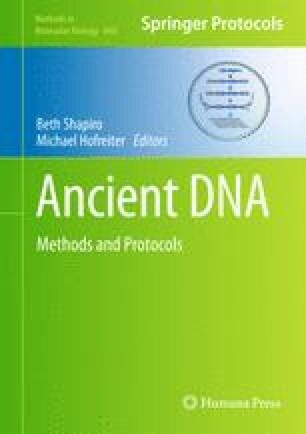 However, the application of PCR to ancient DNA (aDNA) experiments often requires significant modification to standard protocols. The degraded nature of most aDNA fragments requires targeting shorter fragments, performing replicate amplifications, incorporating multiple negative controls, combating PCR inhibition, using specific DNA polymerases to deal with damaged bases, working in a separate aDNA facility, and modifying the PCR recipe to deal with damaged and low copy-number target DNA. In this chapter, we describe how and why these procedures are implemented, discuss aDNA-specific troubleshooting methodology, and suggest modifications to commercial cloning and sequencing procedures to reduce the expense of PCR product cloning.